It’s a foam party! Just connect to any garden hose and drop some serious suds with the new TORQ Snow Foam Blaster R1 Foam Gun. Getting your vehicle to look great always starts off with a good wash! Detailing is a hot button topic for the automotive enthusiast community, achieving a scratch free wash while producing the best possible shine retains a high priority for every aficionado. 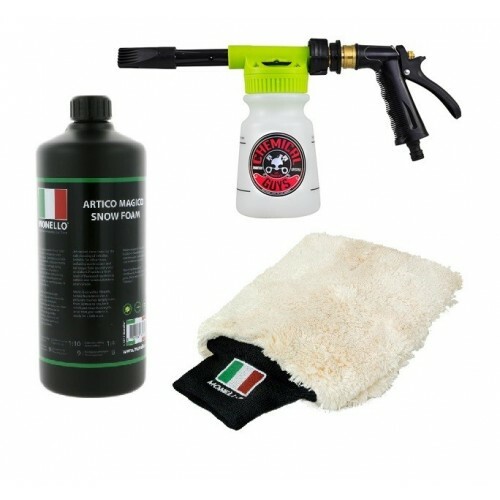 Chemical Guys TORQ Snow Foam Blaster R1 Foam Gun constitutes the cutting edge in foam gun technology. 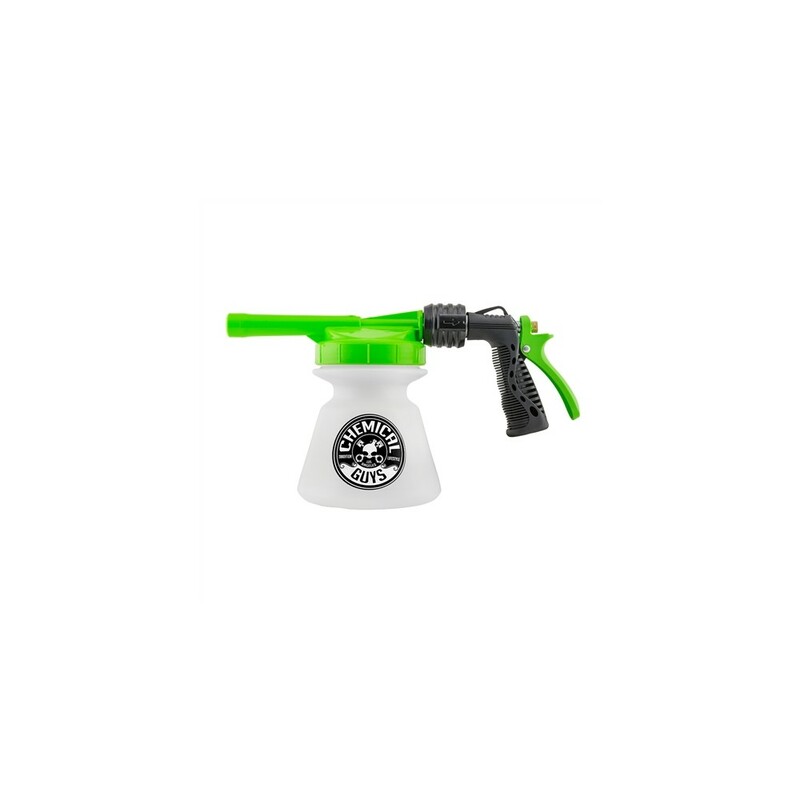 The TORQ Snow Foam Blaster R1 Foam Gun produces a substantial amount of foam to lubricate the surface, and prevents scratches by allowing a wash mitt to glide effortlessly. 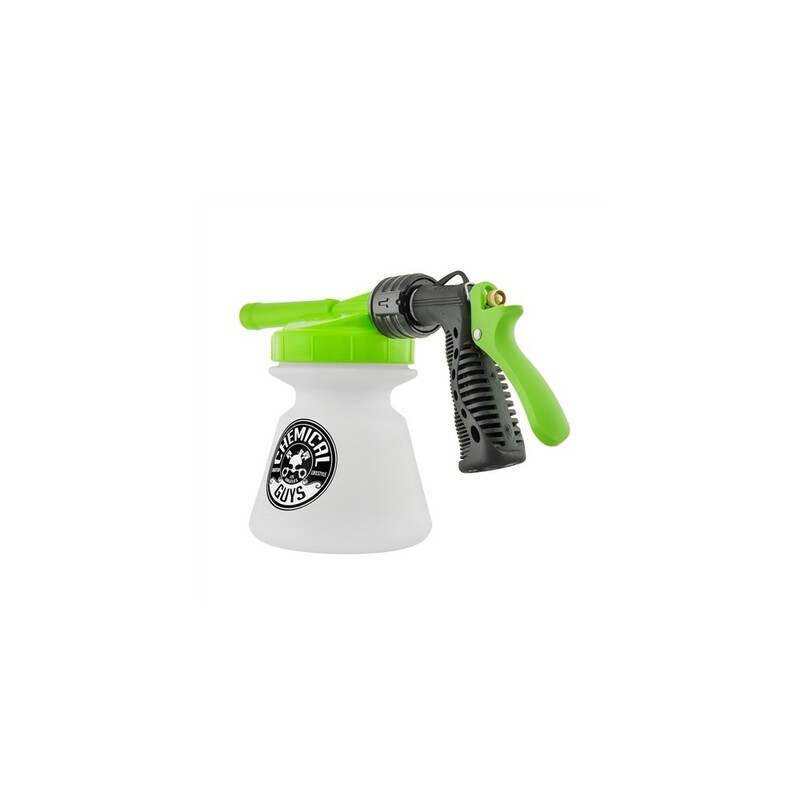 The TORQ Snow Foam Blaster R1 does not require any special pressure washers or extra equipment; simply attach it to any garden hose for instant foam action. The special design of the foam gun mixes car wash soap with water and air to create thick car wash foam. Choose from the three interchangeable water pressure tips to mix the perfect foam thickness for your car, or simply use as is for the most suds. Pair the TORQ Snow Foam Blaster R1 with your favorite Chemical Guys soap to produce unbelievable rich suds, and give your car, truck, or SUV the total scratch free wash it deserves. 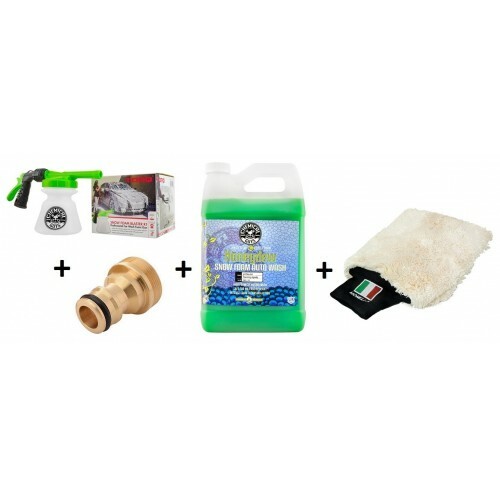 Car wash foam is one of the professional’s secrets to a scratch-free car wash. For a long time, getting premium suds required a pressure washer, electric or gas, and was limited to professionals. 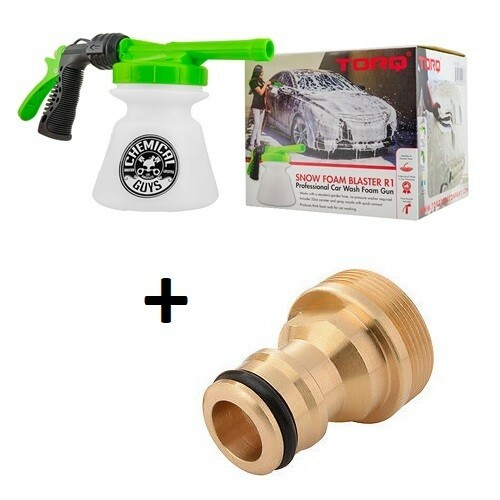 The TORQ Snow Foam Blaster R1 Foam Gun delivers the same premium suds without the need for a pressure washer, it connects to any garden hose for superior foam and fun. 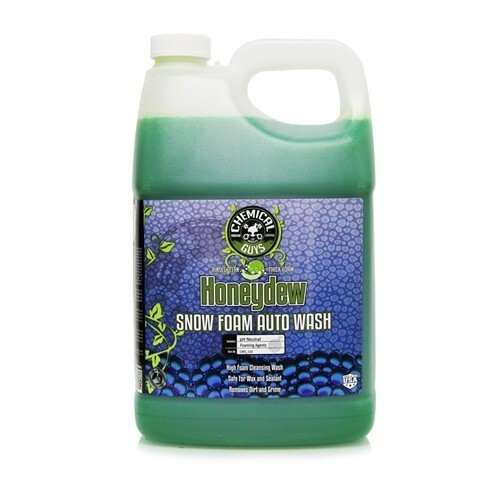 The TORQ Snow Foam Blaster R1 turns every car wash into a foam bubble bath for your car. 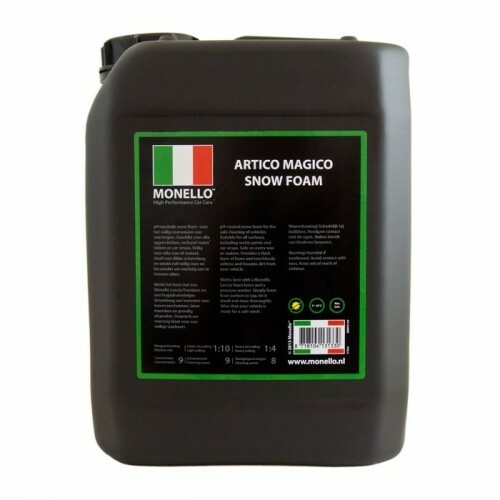 Bathing a car with slick car wash foam removes abrasive dirt particles gently and without grinding them into paintwork. Over 95% of swirls and scratches come from improper car washing, and drying techniques. Adding slick car wash foam to the equation drastically reduces the risk of installing swirls and scratches on painted surfaces. 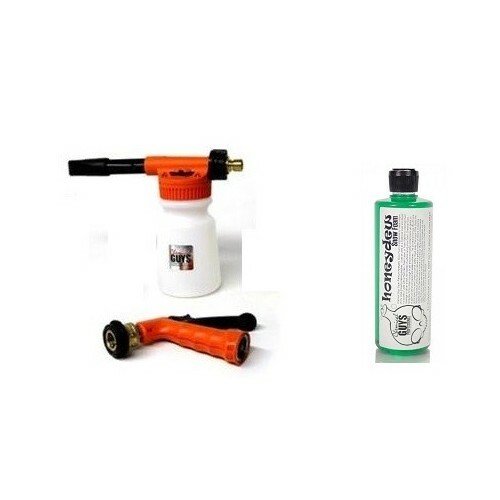 While professional detailers invest in expensive pressure washers and filtration systems to use powerful foam cannons, the car detailing enthusiast can achieve much of the effect with only a standard garden hose and the TORQ Snow Foam Blaster R1 Foam Gun. The TORQ Snow Foam Blaster R1 mixes the perfect amount of car wash soap with water, and air to create thick soapy foam to gently clean any vehicle. 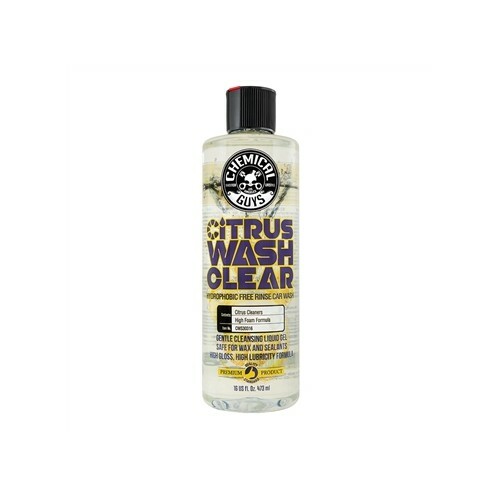 The TORQ Snow Foam Blaster R1 can be used with any premium Chemical Guys car wash soap. Simply fill the bottle with water, and add 1 - 3 ounces of your favorite car wash shampoo for a foamy car wash experience. When it comes time for the final rinse, unclip the foam bottle with the quick release fitting, and spray the car down with the sprayer nozzle. Choose the The TORQ Snow Foam Blaster R1 for professional detailing results with only enthusiast investment. The pressure washer is one of the newest trends to hit the detailing scene, but there’s only one problem; pressure washers can be very expensive and loud. 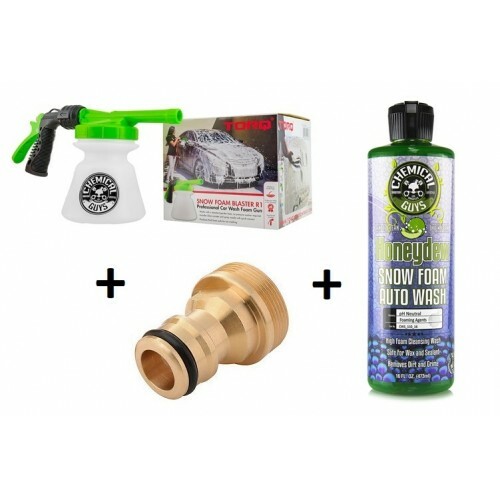 Chemical Guys TORQ Snow Foam Blaster R1 Foam Gun gives you the power to blanket your car with a foamy layer of satiny suds with a regular household garden hose. The R1 is a cut above the rest with its durable construction, and ease of use favored by both the pros as well as the enthusiasts. The TORQ R1’s pistol grip handle is designed ergonomically for any dominant hand preference, the rubberized comfort grip handle makes it possible to maintain a firm grasp of the foam gun. The heavy duty diecast body will not warp if dropped, and the easy store clip makes it convenient to hang the grip from a tool rack. 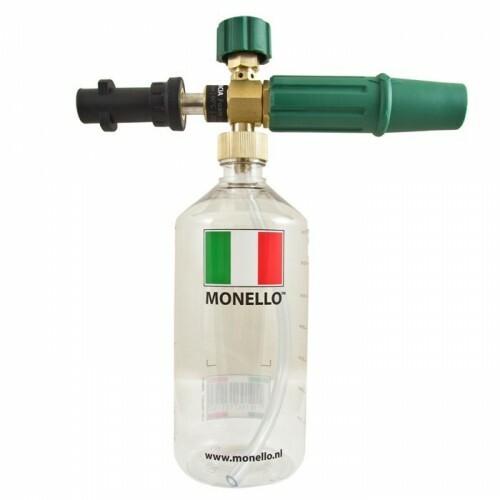 The fast connect system makes it simple to attach a hose to the comfort grip. The In-line filter mesh screen captures any extra abrasive particles flowing through the water pipes and hoses. 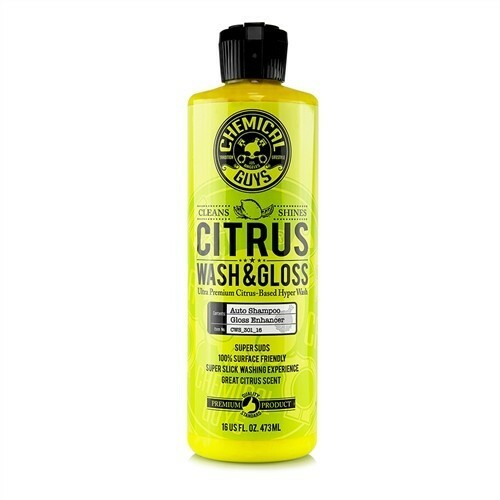 The chemical resistant soap container gives you plenty of room to fill up with your favorite Chemical Guys shampoo. The TORQ Foam Blaster R1 Foam Gun doesn’t need a pressure adjustable knob because it generates the perfect amount of foam all the time! Last but not least, the TORQ R1 comes with three interchangeable water pressure tips granting you the power to adjust the pressure settings to produce the ultimate amount of velvety, frothy suds. The idea behind a TORQ Snow Foam Blaster R1 is to produce mounds of suds that help minimize the amount of friction, rubbing, and scrubbing a vehicle's surface usually is exposed to during a traditional wash. Foam starts loosening and lubricating the paint immediately lifting dirt and contamination away from the surfaces and into the mounds of soap and away from your delicate paint. As you work your way down and around the vehicle with a microfiber wash mitt or sponge, you don’t have to use as much force to remove dirt and debris. The TORQ Snow Foam Blaster R1 is the tool that every budding detailer, and battle tested professional turns to for the maximum amount of foam without the need for a pressure washer. Adding thick car wash foam drastically reduces the risk of installing scratches during the car wash. 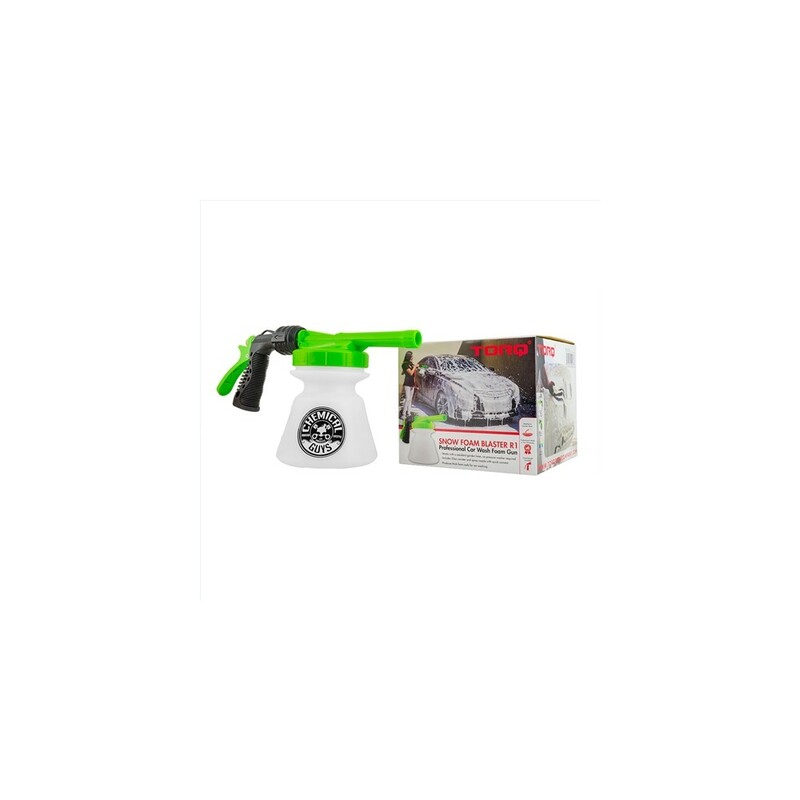 The TORQ Snow Foam Blaster R1 Foam Gun blends the perfect amount of car wash soap with air and water to produce thick flowing foam to gently bathe any vehicle. 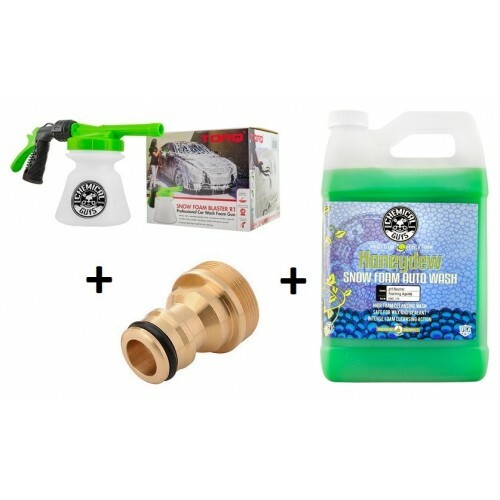 Simply attach the nozzle to any standard garden hose, then clip the foam blaster bottle onto the quick release clip for fast changes between rinse and foam action. 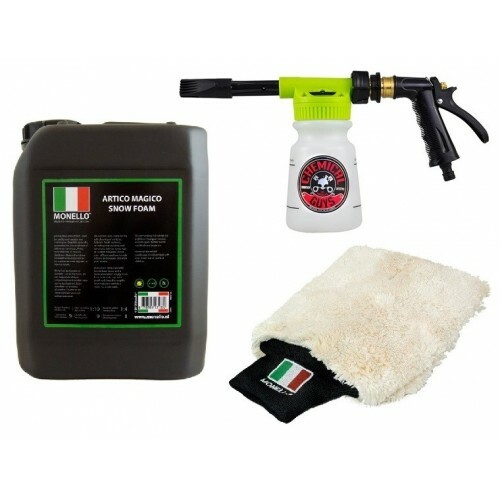 The TORQ R1 Snow Foam Blaster works in tandem with a two-bucket wash system with Cyclone Dirt Trap’s, and a chenille wash mitt to complete the ultimate scratch free wash to leave your vehicle’s paint looking spotless. 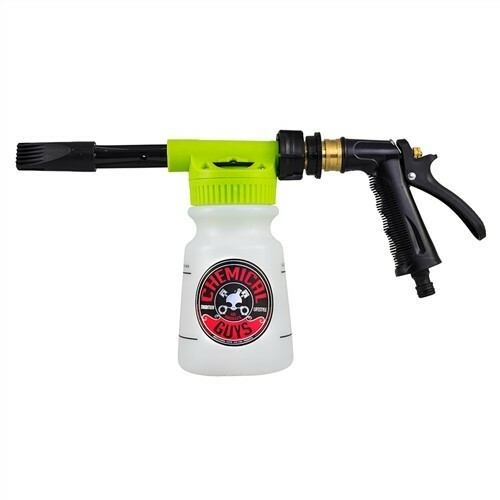 The ultimate foam gun has arrived: with the TORQ Snow Foam Blaster R1 Foam Gun eliminating unwanted dirt is as simple as connecting your hose, and unleashing the unparalleled foaming power that detailing enthusiasts crave. 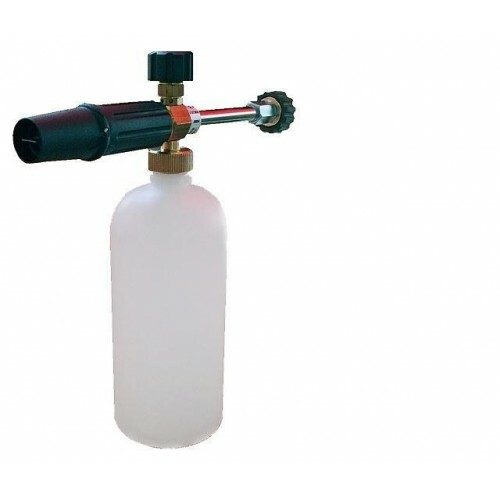 The TORQ Foam Blaster Foam Gun comes in a complete two-piece system. 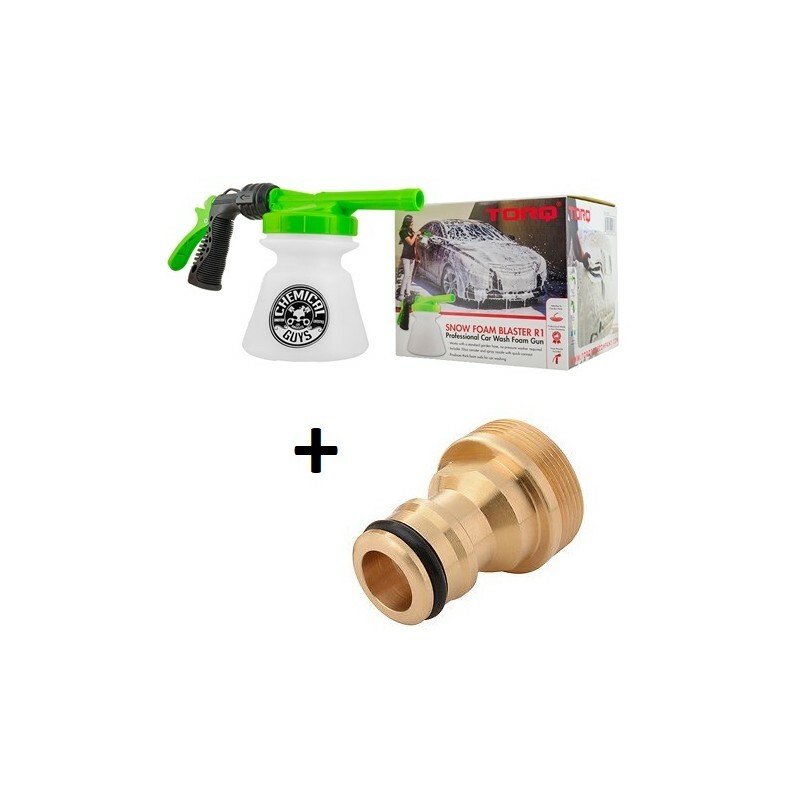 Easily rinse dirt, grime, and debris from the car using the rugged nozzle. The quality aluminum and brass nozzle attaches to any standard garden hose, and sprays a steady stream with a light squeeze of the handle. Save water when it’s not needed! The nozzle stops water flow when it’s not in use, thus saving countless gallons of water over the span of a few car washes. 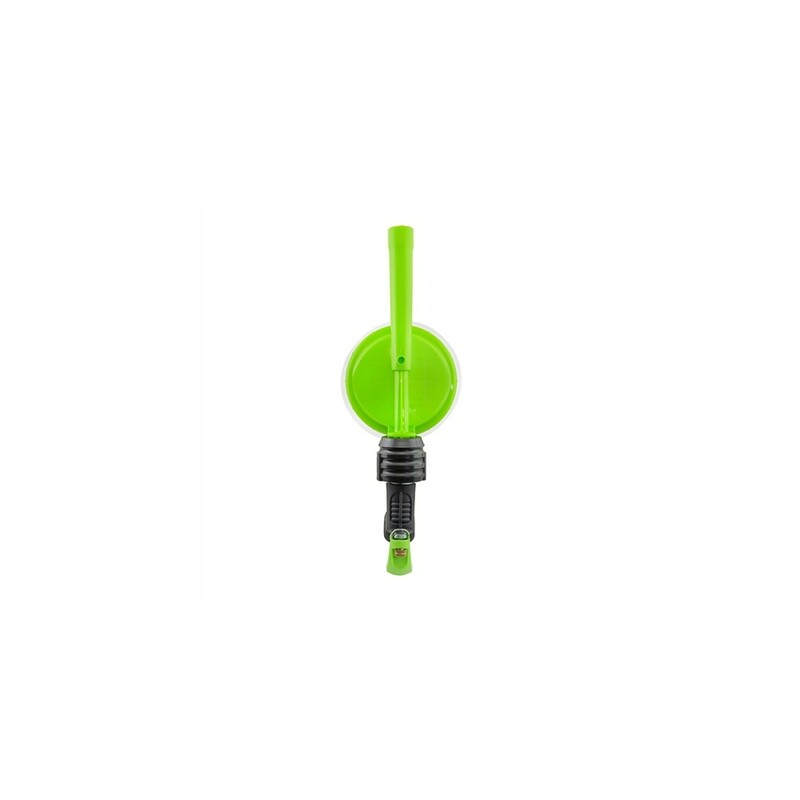 The TORQ Snow Foam Blaster R1 snaps into the front of the nozzle via a quick release ring. Simply snap the ring back to slide the foam gun on the nozzle, and you’re ready to foam any car! At the end of the foaming and bucket wash, snap the foam gun off and rinse down the car for a show car finish. 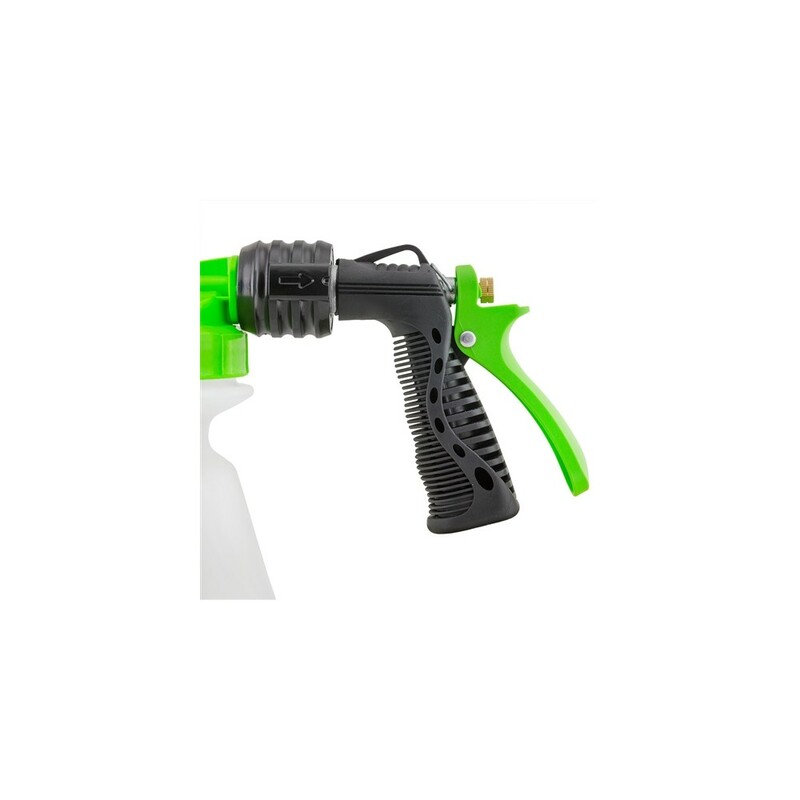 The Foam Blaster also ships with a quick-release adapter to attach the nozzle to any garden hose shut-off valve. Gardening and home improvement enthusiasts know, and love quick release attachments to save time when switching between nozzles and watering wands. Not ready to use a quick release? 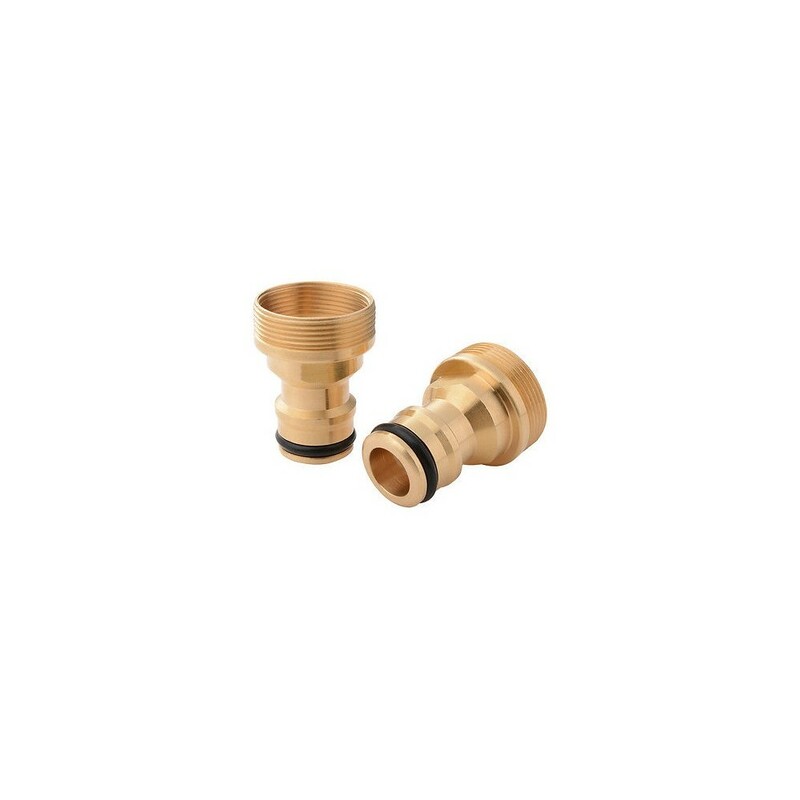 Unscrew the included adapter and attach the nozzle directly to your garden hose. Save the adapter in the garage until you’re ready to start using a quick release system for faster hose nozzle switches later on! 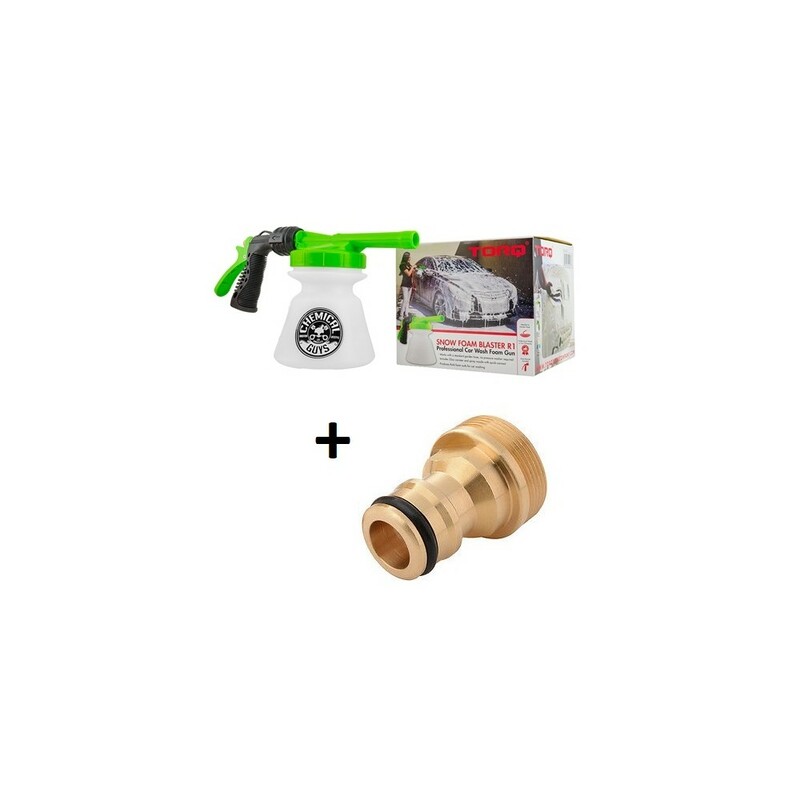 High quality plastics, aluminum, and brass components will not rust, corrode, or seize from regular and normal use washing any car, or for normal watering and housework with the garden hose. Choose the The TORQ Snow Foam Blaster R1 Foam Gun for ease of use, superior performance, and high grade construction that won’t let you down.